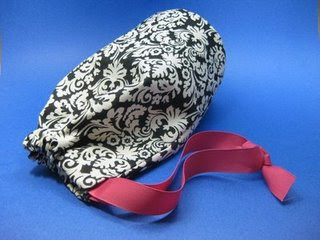 Drawstring bags are great to have around if you need somewhere to stash money when you are in the middle of dancing. Just slip it around your wrist, stuff the money in, tug it closed, and keep on groovin' to the beat! My sister asked me to make her a "money bag" that she could use for the money dance at her wedding. Knowing she likes the nouveau-French style and had pink as a wedding color, I came up with this style. I found the cute damask fabric in the remnants bin at JoAnn's, and I already had the wide grosgrain ribbon on hand. To make the bag, I cut out the circle bottom then measured the circumference and used that measurement as the length of the rectangle that comprised the rest of the bag (taking into account seam allowances of course). This is a very simple project that really doesn't require a pattern. I sewed it by hand because my sewing machine wasn't working at the time.